There are plenty of health and fitness gadgets and apps out there. I wrote about some of them I saw at CES here. 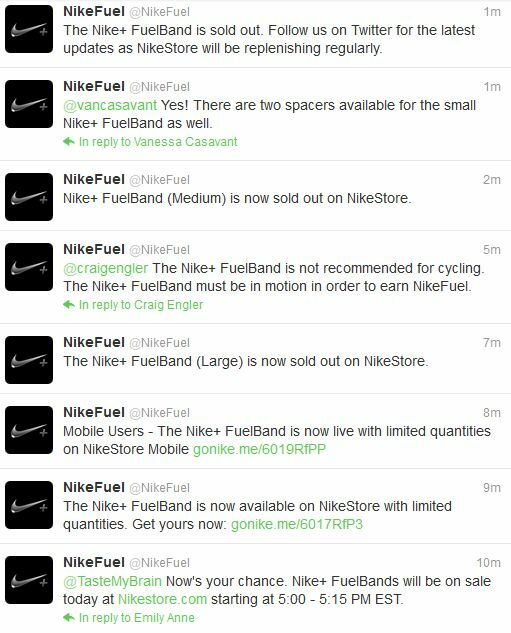 Probably the most-anticipated out of these was the Nike Fuel Band. The Swoosh-powered band was announce some time ago and immediately sold out pre-orders. Since then, chances of getting your soon-to-be-sweaty hands on one have been as slim as users hope to be. Today their Twitter account let loose the hint that there would be a new supply available at around 5pm EST – I was waiting. I have to give their social team props for being on top of the situation. They definitely got things out there as quickly as I’m sure they had info. However, the actual process of ordering was pretty horrible. The site crashed twice on me before I got through to the final confirmation page… only then to see that the product I had ordered (and input my address, phone number, email, and credit card info for) was sold out. Oh well… I guess there’s always next time. Still haven’t got one, but Nike’s stuff at SXSW was awesome!